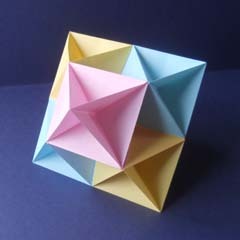 The Modular Origami Design Encyclopaedia is a visual catalogue of modular origami designs arranged by theme. The catalogue is built around my own design work but is being extended to include designs by other paperfolders where I feel they have particular significance to the development, and particularly the early development, of the theme. If you notice that important designs have been missed please let me know. The information about individual designs generally includes a credit giving the name of the paperfolder who is believed to have first discovered the design. Credits are also given to other paperfolders who are known to have independently originated the same design before it became widely known. The question, 'Who got there first? ', is often difficult to resolve. Because of this these credits should be regarded as provisional rather than definitive.